There's a strangely chaotic moment halfway through Tony Daniel's Deathstroke Vol. 1: Gods of War. Deathstroke and his mysterious benefactor are interrogating an enemy in a remote, hidden safehouse when all of the sudden other characters just start walking in the door, some of whom the audience has met before and some of whom Deathstroke just seems to know even as the audience doesn't. Not long after, Deathstroke has taken a job from them, without much discussion as to who these people are or why they're all working together. Gods of War's occasional tendency to go where the wind takes it like this, I have to say, reminded me somewhat of the Rob Liefeld run that preceded it. Indeed this Deathstroke book followed more than I expected the model of Kyle Higgins and Liefeld's New 52 Deathstroke before it, when I had thought DC Comics might have opted for a different approach. That's not all bad; both Higgins and Liefeld wrote popcorn-flick high-action stories, and if that's what you're in the mood for then Gods of War delivers the same. What ultimately differentiates Tony Daniel's Deathstroke from what came before is that Daniel "kills" Deathstroke Slade Wilson and places his consciousness in a younger body (one not coincidentally resembling his television counterpart). At the same time, this could be read as a thematic continuation of where Deathstroke started in Kyle Higgin's debut New 52 volume, in which Deathstroke was an "old" assassin having to prove his worth to a younger crew; now Wilson is a young guy trying to regain his "older Deathstroke" credibility (a running gag in the book, unintentionally funny I think, is that no one believes Slade is who he says he is). Slade's de-aging is among other things a plot device that allows Daniel to weaken the character, often necessary in Deathstroke stories. Not unlike the all-powerful Superman, I imagine it's hard to find credible threats to pit against unstoppable assassin Deathstroke; younger Deathstroke therefore becomes "stoppable" Deathstroke. I did think Daniel played off this cleverly, however, in that Slade actually struggles with having two eyes after only having one for so long, and has to close one eye to focus in a fight. I think we all expect that this Slade is going to have to blind himself at some point to regain his "mojo"; Daniel teases that late in the book but it doesn't happen quite yet. 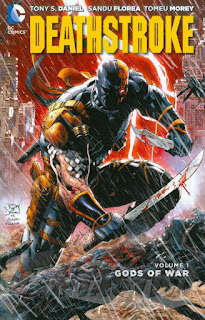 I tend to prefer my Deathstroke stories "realistic" -- master assassin on covert missions, a la Marv Wolfman's "Nuclear Winter" -- and in many respects Gods of War delivers. The first three chapters, especially, are spot on, in Deathstroke trying to fulfill a contract and finding himself part of a conspiracy that may be of his own devising (if he could remember). I also enjoyed, for its surprise value, the sudden appearance of Slade's son Jericho, and Daniel's introduction of Slade's father, called Odysseus, which is the first time I can recall that an author has delved into Slade's parentage. But in the last three chapters, Gods of War's hits and misses tend to blur together a little more. The fourth chapter developments don't make a lot of sense -- why is DC stalwart I-Ching working for the CIA, and if I-Ching is working with the character Red Fury, why did I-Ching warn Slade of danger earlier just before Red Fury arrived? Then Slade goes off to Gotham, which includes a pretty great team-up with Harley Quinn, but also a fight with Batman that doesn't serve much purpose other than to fill the fifth issue. The book concludes with a good enough action sequence -- but then Slade suddenly falls unconscious, wakes up, we're told by narration boxes that he's taken another job, and that's the (sudden) end. Also, though I'm pretty well a sucker for appearances by Jericho, the super-powerful-but-whiny Jericho that followed from the middle of Geoff Johns's Teen Titans run to the New 52 and now here continues to annoy more than impress. Daniel also uses Rose Wilson, nee Ravager -- another favorite -- but Rose's new costume is hideously silly, with shades of one of Liefeld's Wildstorm creations. (Parallel this, again, with Daniel's ably-drawn and reasonably funny Deathstroke/Harley Quinn pairing, and it's almost as if the book has two different creative teams.) And the novelty of seeing Jericho and Rose wore off quickly, especially as I remembered they factored into the finale of Justin Jordan's Deathstroke in the last series. On one hand I credit Daniel for using all of the "Deathstroke family"; on the other hand, it can't help but feel repetitious at this point. I did like that Daniel uses Deathstroke as a stage for spotlighting DC Comics's best-known martial arts characters, including the aforementioned I-Ching (which Daniel also used in the pre-Flashpoint Batman: Eye of the Beholder), Bronze Tiger, and Lady Shiva. One imagines Daniel probably wanted to use Richard Dragon too, if he wasn't otherwise occupied in Green Arrow. At the same time, continuity is not a big stumbling block for this book; Shiva is late of Nightwing and Bronze Tiger of Red Hood and the Outlaws, where I could have sworn (though I didn't go back and read) that he was an actual man-tiger, and I'm not sure how that matches up with this. Also apparently something's up with Ra's al Ghul that I think stems from Red Hood, and also Deathstroke and Harley reference heavily something that happened in New Suicide Squad Vol. 1: Pure Insanity, the collection of which won't be released until a month after this. Not to mention that much of the Jericho and Rose Wilson material here either does or doesn't line up with the last Deathstroke series and parts of Superboy, Teen Titans, and Ravagers. When we set Tony Daniel's Deathstroke Vol. 1: Gods of War next to Rob Liefeld's "Lobo Hunt" and the final issues of the last series, Daniel's is eminently more readable. It's a little more of a toss-up with Kyle Higgins's Deathstroke Vol. 1: Legacy, which was both a good "realistic" Deathstroke story and a cogent commentary on the New 52 (even if Legacy, too, went back to the well of Slade's family). I can't say Daniel's quite at the level of Marv Wolfman's Deathstroke -- ultimately what I'd like to see here is a little less action, a little more plot -- but neither am I ready to write this one off entirely yet. I wouldn't have thought next volume's Deathstroke versus the Olympian gods was for me, but now I'm curious what Daniel might do with it. Hm, your making me worried comparing it to the Leifeld run....although I did like the Higgins run very much so I need to flip a coin at this point. You could conceivably read the Higgins run and jump straight to the Daniel run and not feel like you missed anything; not that this book really turns on the continuity of the Higgins nor the Liefeld runs at all, but again, there's a sense of Higgins and Daniel's runs bookending one another. Dialogue is better than in the Liefeld book, art is better than in the Liefeld book, but there's a Liefeldian sense of "Who cares if it makes sense? Fight scene!" So. I mean, if you had to spend twenty bucks on this or on Batman and Robin Vol. 6: The Hunt for Robin, opt for the latter. I'm skipping Lobo Hunt and going straight into this. Although I didn't really like Legacy compared to the other two titles of Higgin's I've read, Nightwing and C.O.W.L. And you'll be fine, understanding-wise. But surely this book is no COWL.